Cargill will exhibit and present at Food Ingredients Europe (FiE) 2013. MECHELEN, Belgium – 16 October 2013 – From November 19 to 21, Cargill will be exhibiting and presenting at Food Ingredients Europe (FiE) 2013, the international food and beverage ingredients trade show taking place in Frankfurt, Germany. 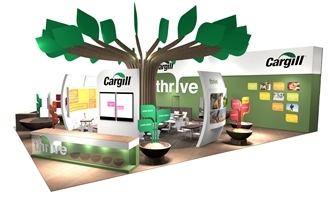 Cargill’s stand (J07, hall 8) will be open to visitors and media under the “Helping customers thrive” theme. It will demonstrate how Cargill works to develop innovative products that meet the industry’s needs, while increasing customers’ speed to market, protecting their brand and business, and enabling sustainable growth. Cargill's stand (J07, hall 8) will be open to visitors and media under the "Helping customers thrive" theme..
Cargill works with customers on carving out answers to growing consumers’ needs. Today’s most pressing industry concerns revolve around natural origin ingredients and technologies that can guarantee reliability of supply, optimal cost-value balance, enhanced health benefits for the consumer, and front-of-package claims that set apart from competition. Cargill is committed to solving these concerns by providing its customers with fully scalable, on-target solutions, like the nine new prototypes that will be presented on Cargill’s stand. Leveraging the industry’s broadest portfolio and deeply rooted application knowledge and expertise, Cargill’s Innovation Centers have developed innovative and easy-to-apply solutions across different market segments, like the multi-flavored chocolate-covered pectin jellies; a fun cocktail with Cargill’s grain alcohol and alginate pearls; or an “inside out” caramel chocolate praline, featuring the dairy caramel white chocolate Caramel Equilibre, an indispensable ally in successful product line extensions. Additionally, Cargill’s Truvia® stevia leaf extract sweetener is highlighted through several great-tasting applications relying on solid formulation expertise, such as ice tea, chewing gums and a chocolate milk which target the mid, low and no-calorie segments. All prototypes will be available for tasting and visitors will have the chance to discuss their properties and diverse application possibilities with Cargill’s technical experts. Cargill’s experts will also actively participate in the FiE conference program with three speaking sessions: Thorsten Bornholdt, Fluid Lecithin Product Manager, will explain the evolutions in the lecithin markets and discuss the increasing importance of non-GM sunflower lecithin as a reliable alternative to soy lecithin, on Tuesday 19th November, 12 PM. Caroline Chabot, Marketing Manager Health and Nutrition, will share the latest market insights on consumers’ acceptance of stevia in naturally sweetened beverages, on Wednesday 20th November, 11 AM. In addition, on Tuesday from 2 PM onward, Saskia Samama, Marketing Manager Sustainable Cocoa, will hold a focus session on the positive impact of sustainability on cocoa farmers, their communities, suppliers and manufacturers, outlining the most effective ways of increasing the volume of certified sustainable cocoa. This focus session builds on Cargill’s Cocoa Promise initiative, a finalist for the FiE Sustainability Excellence Award.